Husband: It’s over. I want a divorce. I’m leaving. Tonight. Actress: You’re telling me this through text? Husband: Stop changing the subject. It’s over. Actress: Where is this coming from? You’ll divorce me? I’ve stuck it out through everything. Husband: I’m sick of begging for you to do things other women would do in a heart beat. Actress: Fine, divorce me. I don’t care. Husband: You will care, no man is going to want you, look at you. I’m the best you’re ever going to get. Actress: So you’re leaving me because I’ve asked you to spend more time with me and the kids. Husband: Good luck finding a man who will do that. The conversation continued like that, over and over, back and forth, with the husband slamming her down, blaming her, telling her she wasn’t good enough. Finally, with her apologizing and him agreeing to not move out and stay. 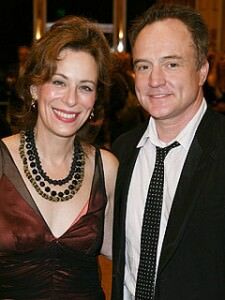 Actor Bradley Whitford and wife Jane Kaczmarek filed divorce papers Friday in Los Angeles, PEOPLE has confirmed. “He hopes the media will respect their wish for privacy as they focus on their children,” says a rep for Whitford. The former West Wing star and Malcolm in the Middle mom were married in August 1992, and have three children, Frances Genevieve, 12, George Edward, 9, and Mary Louisa, 6. No Blinders guessed this one correctly. We didn’t see it coming either. But BuzzFoto did! PS: With whom do you think Bradley Whitford was cheating?